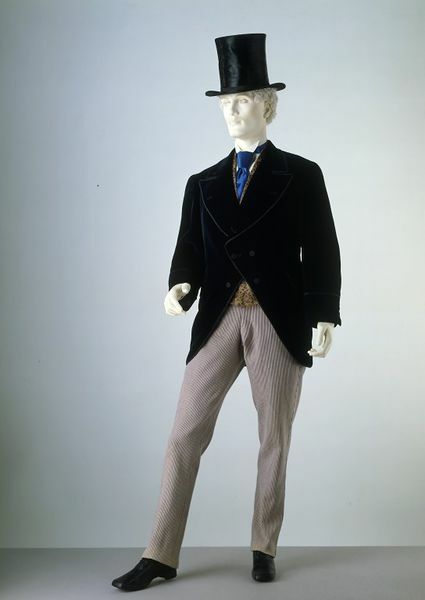 While formal daywear grew very dark and sombre in colour during the latter half of the 19th century, light fabrics, plaids and stripes were favoured for casual dress. 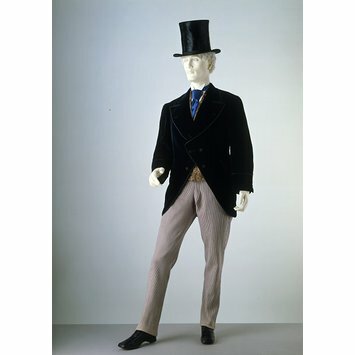 These trousers taper to the ankle, characteristic of the early 1870s. They have no waistband and are held up with braces. The hips and upper part of the legs are cut full, but the latter tapers to the ankle. The waist is high behind, with fly front and two pockets with horizontal slits. Part lined with cotton, three silk covered buttons, the remainer are metal. Hill Bros. 3 Old Bond Str. Stamped on the metal buttons.